Last Monday, Cox Habbema (1944-2016) passed away. She was a Dutch actress, stage director, writer and former managing director of the Municipal Theatre in Amsterdam. From 1969 till 1984 she mainly lived and worked in East-Berlin, where she appeared in several films. Among her Dutch films is the controversial thriller De stilte rond Christine M./A Question of Silence (1982). Cox Habbema was 72. East-German postcard by VEB Progress Film-Vertrieb, Berlin, no. 3307, 1968. Retail price: 0,20 DM. Photo: Reinke/Defa. Publicity still for Wie heiratet man einen König/How to marry a king (1968). East-German card by VEB Bild und Heimat Reichenbach, Berlin / VEB Progress Film-Vertreib, Berlin, no. 8 / F / 72. Photo: Schwarz / Defa. Cornelia ‘Cox’ Habbema was born in Amsterdam in 1944. Her brothers are Diederik Habbema and TV and stage director Eddy Habbema. She studied history and for a short while law and then went to the Toneelschool Amsterdam (the Amsterdam Theatre School), where she studied acting and directing. In 1963, the then 19-year-old Habbema made headlines with a brief affair with the 39-year-old singer Charles Aznavour. Habbema attended his Dutch concerts where she came into contact with Aznavour. He invited her to go with him to his villa on the Riviera, but at Schiphol the military police became suspicious and contacted the family. They commanded the plane, which was on its way to the runway, to return. Cox - at that time still legally a minor - was met by two military policemen on board and handed over to her uncle. In 1967, Habbema made her stage debut at Toneelgroep Centrum (Theatre Group Centre). 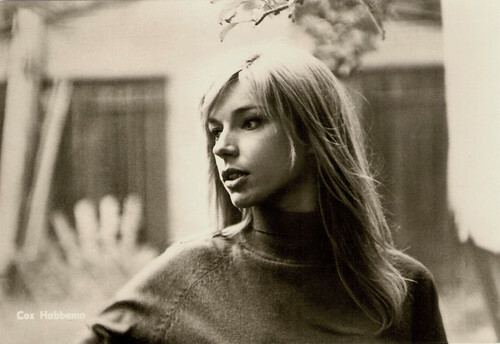 Her first film appearance was in the Dutch New Wave production Heart Beat Fresco (Pim de la Parra, 1966), two years later followed by To Grab the Ring (Nikolai van der Heijde, 1968) with Ben Carruthers and Françoise Brion. It was entered into the 18th Berlin International Film Festival. Meanwhile she was a stage intern of theatre companies in London, Paris, Italy, and Berlin. In Germany she was offered the leading role in the Defa production Wie heiratet man einen König?/How To Marry a King (Rainer Simons, 1968) opposite the German actor Eberhard Esche. He also became her husband. From 1969 till 1984 she mainly lived and worked in East-Berlin. During this period she was an actress and director for the legendary Deutsches Theater (German Theatre). With Eberhard Esche she also made a series of productions with classical ballads and Heinrich Heine poems. She was both director and singer-performer for these productions. East-German postcard by VEB Progress Film-Vertrieb, Berlin, no. 19/69, 1969. Retail price: 0,20 DM. Photo: Weidt / Defa. 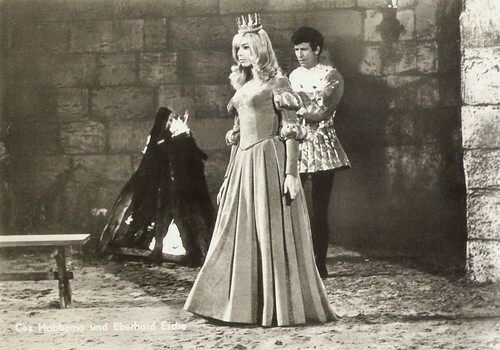 Publicity still for Wie heiratet man einen König/How to marry a king (1968) with Eberhard Esche. East-German postcard by VEB Progress Film-Vertrieb, Berlin, no. 26/69, 1969. Retail price: 0,20 DM. Photo: Weidt / Defa. Publicity still for Wie heiratet man einen König/How to marry a king (1968). During the 1970s, Cox Habbema played in Dutch and Belgian films and TV series as well as in (East-)German productions. Among her German productions are the crime film Der Mörder sitzt im Wembley-Stadion/The Murder is sitting in Wembley Stadium (Gerhard Respondek, 1970), the Sci-Fi film Eolomea (Herrmann Zschoche, 1972) opposite Bulgarian actor Ivan Andonov, and the medieval adventure tale Till Eulenspiegel (Rainer Simon, 1974). On TV she appeared in the popular Krimi series Polizeiruf 110/Police Call 110 (1973). 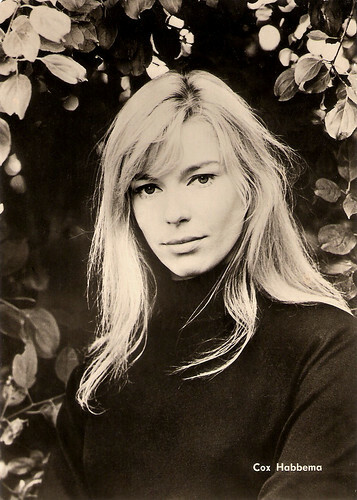 She also worked regularly in Belgium, where she played in films like Ieder van ons/Everyone of us (Frans Buyens, 1971) and the TV Series Centraal Station/Central Station (Paul Cammermans, 1974). In the 1970s there was a revival of the Dutch cinema and Cox Habbema starred in such productions as the thriller Rufus (Samuel Meyering, 1975) between Rijk de Gooyer and John van Dreelen, the drama Kind van de Zon/Child of the sun (René van Nie, 1975), De komst van Joachim Stiller/The Arrival of Joachim Stiller (Harry Kumel, 1976), and Dokter Vlimmen/Doctor Vlimmen (Guido Pieters, 1977). Henk van Gelder in his necrology for the Dutch newspaper NRC: "At that time, she was known primarily as a 'voyant' blonde with a vamp-like appearance and a subtle ironic tone in the way she, somewhat veiled, expressed her lines." Habbema appeared opposite husband Eberhard Esche in the Defa productions Leben mit Uwe/Life with Uwe (Lothar Warneke, 1974), Die unverbesserliche Barbara/The Incorrigible Barbara (Lothar Warneke, 1977), also with Hertha Thiele, and the fantasy Der Spiegel des großen Magus/The Mirror of the Great Magus (Dieter Scharfenberg, 1980). Big East-German card by VEB Progress Film-Vertrieb, Berlin, no. 181/21, 1971. Photo: Defa. East-German postcard by VEB Progress Film-Vertrieb, Berlin, no. 17/72, 1971. Retail price: 0,20 DM. Photo: Defa. 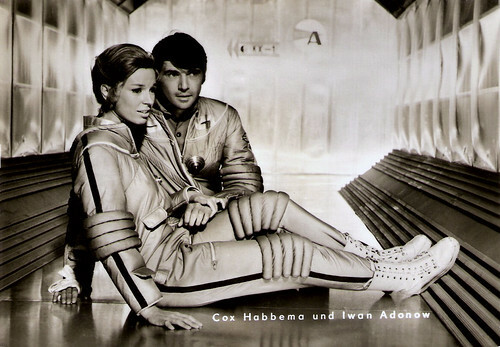 Publicity still for the East German/Soviet/Bulgarian coproduction Eolomea (1971) with Cox Habbema and Ivan Adonov. In 1984 Cox Habbema returned to the Netherlands. Her film career, both in Germany and in the Netherlands, was over. She worked for the Dutch television as a presenter, producer and editor. Between 1986 and 1996 she was the director of the Stadsschouwburg Amsterdam (Municipal Theatre Amsterdam). Café Cox, a popular theatre hang-out in the Stadsschouwburg building, was named after her. It was a tumultuous period in which she regularly collided with the stage company Toneelgroep Amsterdam (TGA) about the playing of the theatre. In 1991 and 1992 Habbema played in the popular Dutch TV series Medisch Centrum West/Medical Centre West. In Germany she had a guest role in an episode of the series Unser Charly/Our Charly (Dieter Kehler, 1998). Other television series in which she appeared were Oog in oog/Eye to Eye (1992), Eindeloos leven/Living Endlessly (1995), and the soap series Het Glazen Huis/The Glass House (2004) starring Willeke van Ammelrooy. Habbema’s most recent TV appearance was in the drama Kilkenny Cross (Eric Oosthoek, 2006). Since her departure from the Stadsschouwburg, she operated in many managerial functions and as a chairwoman for several Dutch cultural institutes, she lectured at the Tilburg School of Humanities and worked as a trainer and consultant. In 2002 Habbema published her memoirs, Mijn koffer in Berlijn (My Suitcase in Berlin). In October and November 2004 she went on tour with her monologue Een vrouw in Berlijn (A woman in Berlin), based on a anonymous diary of a young woman in Berlin at the end of the second world war. In 2006 Cox Habbema was honoured for her special merits for the Dutch society and named Officer in the Order of Orange-Nassau. After her marriage to Eberhard Esche had ended in a divorce, Cox Habbema married lawyer Robert van de Vijver in 1994. He died in 1997. Trailer for Wie heiratet man einen König?/How To Marry a King (1968). Source: DEFA Stiftung (YouTube). Trailer for Eolomea (1972). Source: Michael Zschoche (YouTube). Sources: Henk van Gelder (Nrc.nl - Dutch), Nu.nl (Dutch), Wikipedia (Dutch and German), and IMDb. Cox Habbema (1944) is a Dutch actress, stage director, writer and former managing director of the Municipal Theater in Amsterdam. From 1969 till 1984 she mainly lived and worked in East-Berlin, where she appeared in several films. Among her Dutch films is the controversial thriller De stilte rond Christine M./A Question of Silence (1982). Cox Habbema is a Nederlander celebrity, stage manager, creator and former md of the Public Theatre in Amsterdam.